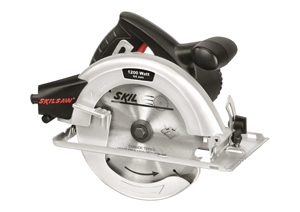 Skil has recently launched the new 5064AA circular saw, aimed at DIY enhtusiasts. Features include compact design for optimum control and guidance; a spindle lock that ensures quick and easy saw blade changing; a safety switch to prevent accidental starting; easy to read scales showing depth, foot and bevel scales, and dust suction facilities that fit most standard vacuum cleaners or dustbags. Specifications include an input power of 1200 W; a no-load speed of 5800 U/min; a capacity of 64 mm at 90Â° and of 47 mm at 45Â°; an saw blade of 184 mm; an arbor of 16 mm, and a mass of 3,5 kg. This tool comes standard with a carbide-tipped blade (twelve teeth), a hexagon key for easy blade change and a parallel guide.